The names are as detailed and descriptive as the butterflies are beautiful: Monarch, Baltimore Checkerspot, Regal Fritillary, Swamp Metal Mark. These are just a few of the species that have benefited from the Prairie Sky Butterfly Lab’s efforts to bolster populations of rare and endangered butterflies native to the Midwest. Butterflies are an important indicator of a healthy environment and ecosystem. They are considered a model species to study the impact of habitat destruction and fragmentation. The conservation of this important pollinator benefits the entire ecosystem. Prairie Sky Butterfly Lab researchers grow host plants, obtain species of females, and protect eggs from predators in the hopes of seeing caterpillars emerge in the spring. As a member of Chicago Academy of Sciences and Peggy Notebaert Nature Museum, Porter-Salvato began breeding and releasing butterflies. In 2006, Dr. Porter-Salvato trained with Vincent Olivares, director of arthropods at the Notebaert's Butterfly Lab, on the pupation of monarchs and swamp metalmark. In 2010, she participated with the museum in the release of nearly 200 Regal Fritillaries just south of Chicago at Paintbrush Prairie Nature Preserve. To get to that point, Museum scientists had to figure out a way for the fragile, tiny larvae to survive the winter. The solution turned out to be placing them in covered cages on the Museum’s roof to give them the full effect of the winter cold. The release of the Regal Fritillary received nationwide attention. Over the last ten years, Butterfly Lab members have participated in the release of Monarchs at sites such as the Chicago Botanic Garden, and Baltimore Checkerspots in a restored wetland at Fermilab in Batavia. The Prairie Sky site has cultivated a wide variety of host plants such as 5 varieties of Milkweed (common, purple, oval, antelope, whorled, ), 3 species of Violets (prairie, sand and birdsfoot), and a range of native, pollinator supporting forbes (wild lupine, spotted bee balm, wingstem, mountain mint). A rite of early summer at Prairie Sky is the day when a new species of rare butterflies are triumphantly released back into nature. In 2017, Prairie Sky's Butterfly Release Project has planned releases of monarchs, fritillary and metalmark, and an overwinter of its Regal Fritillaries larva for release in spring of 2018. 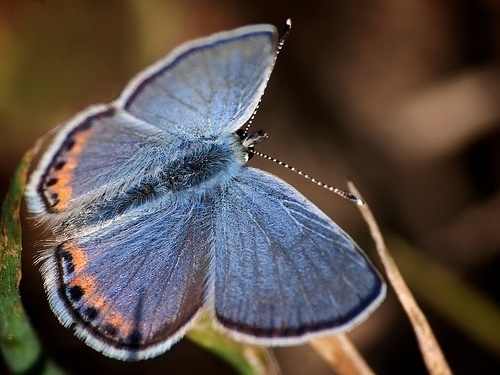 The Prairie Sky Butterfly Lab is planning a new Blue Karner Habitat Restoration Project. The Karner is a flagship species of our globally imperiled pine-oak savanna ecosystems. Oak savannas are characterized by prairie plants dispersed among stands of widely spaced oak trees. Pine barrens are typified by structurally diverse vegetation dominated by scrub oaks and red pines interspersed with grassy openings with wild lupine and nectar plants. Our prairie boarders the Karner blue High Potential Range (HPR) in Wisconsin, as defined by a probability model developed by the Forest Landscape Ecology Lab at UW-Madison. There is a high compatibility of our ecosystem (Pine-Oak Savanna) with probability model variables, including: known locations of Karners, soil type, land cover, slope, elevation and climate. For these reasons, our lab will begin cultivation efforts in 2017, such as planting additional host plants, such as shade grow lupine in our red pines. and nectar plants, such as Canadian horsehide and Spotted beebalm. Monitoring will be preformed and should any be found, protection of eggs from predation. The conservation efforts of the Prairie Sky Butterfly Lab during the 2017 season are supported in part by funding from the Wisconsin Department of Natural Resources, Managed Forest Lands, and Monarch Watch at the University of Kentucky. They have also been supported by corporate sponsors such as Monsanto, Rackow Polymers, and individual donors like you. To become a sponsor or learn more about opportunities at the Prairie Sky Butterfly Restoration Project click here.